← What to do with the Pits? 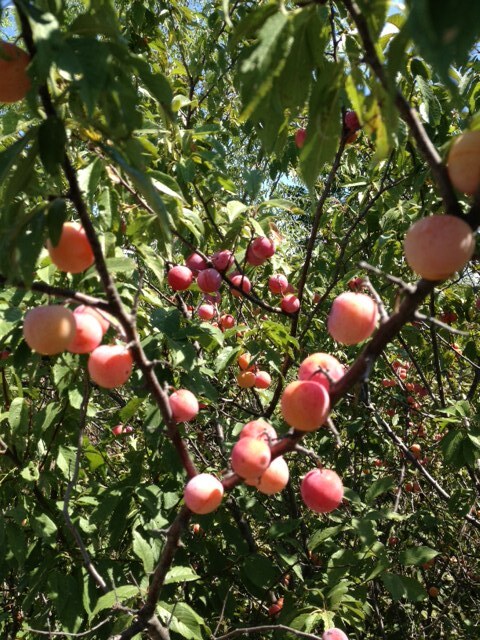 I got an excited call from my Mom this week, telling me that she found some wild plum trees on a road infrequently traveled. Of course, I ventured out the next day with a friend to confirm the fortunate find. Indeed, we found several bunches within reach. 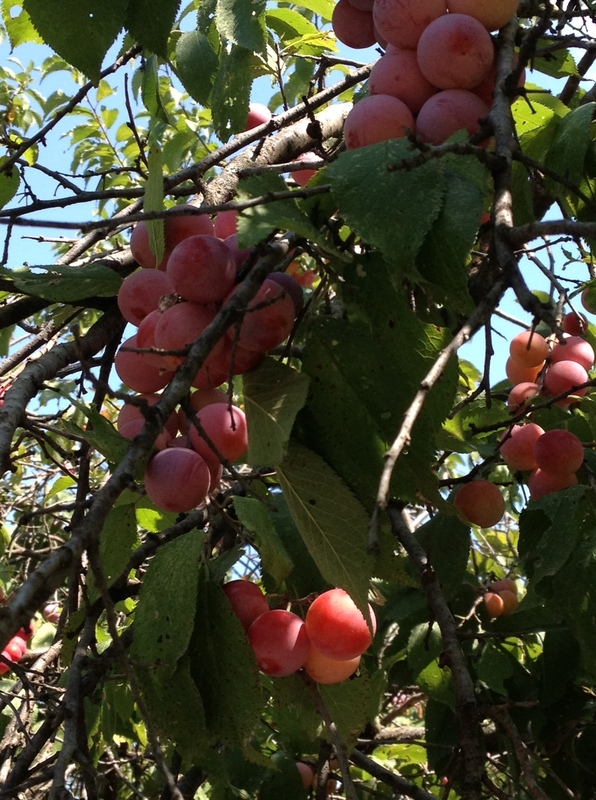 The plums were ripe so a day later, I headed out with two friends, a ladder, bags and a sack lunch for the picking. The gatherers of long past centuries must have loved stumbling upon such treasures, as we did that perfect summer day. The joy of self-sustainability: Picking in the wild, then harvesting the crop. Wild plum jelly, preserves, juice and frozen whole fruit processing will take place all weekend. The fruit cellar or farmers market will display our harvest. Sorting the fruit can be tricky. 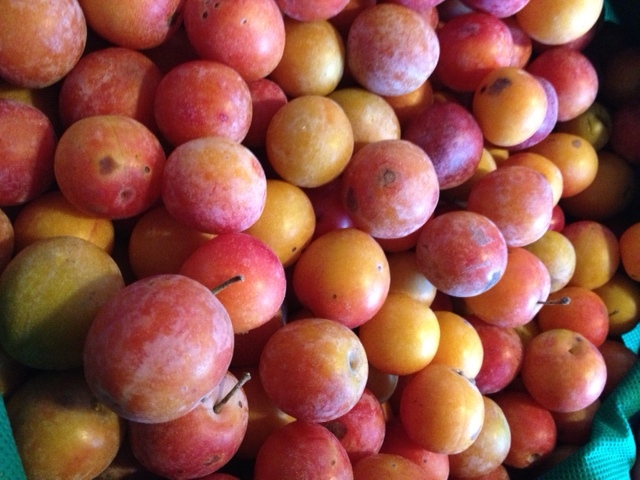 Darker fruit usually means sweet ripeness, yet we found the yellow plums to be soft and sweet, ready to cook into plum jam. The plum thicket was deep and finding our way in and out was tricky business. The few scratches, nettle welts and insect bites, on our arms and legs were worth the harvest. Mom was very happy with her bag of wild plums and offered to join forces in canning them. She knows I’m less experienced in canning fruits so will supervise watchfully preserving a tradition of wholesome simple living. This entry was posted in simple living tips JJ Palmtag and tagged acreage, can, canning, country, homemade, janet palmtag, jar, jelly, JJ Palmtag, plums, preserves, roadside, simple living, wild, wild plum. Bookmark the permalink. You really are into simple living. Love the photographs. What kind of camera do you use? I want to plant an American plum in my home landscape. Do you know if they are safe for horses?